Lenny has announced 8 dates in Mexico, Chile, Argentina and Brazil. Dates to Kick Off at Mexico City's Sports Palace on March 4th 2005. Following an electrifying European stadium tour, multi-platinum recording artist Lenny Kravitz has announced dates for the Latin American leg of his Celebrate! world tour. 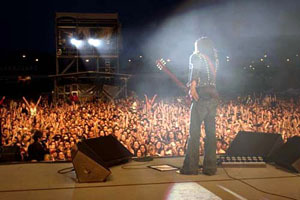 Scheduled to kick off in Mexico City on March 4th, 2005, the tour will hit stadium-size venues in cities throughout Central and South America, with Kravitz performing high-octane versions of hit after hit from his decade-plus career. Since its worldwide release in the spring of 2004, Lenny Kravitz’s 7th studio album Baptism has had incredible success throughout Latin America. The record was written, produced and arranged by Kravitz, who also performed all the instruments on the release, including bass, piano and drums, in addition to the guitar. The album features a string of chart-topping songs, including “Where Are We Runnin’,” and “Calling All Angels,” currently a top five single in Brazil. Kravitz recently performed the track solo at MTV’s 2004 Latin Music Video Awards, held earlier this year in Miami, Florida and it is also featured on the soundtrack of the top-rated Brazilian TV show Senhora do Destino. Throughout his fifteen plus career, Lenny Kravitz has achieved tremendous critical acclaim and commercial success with a succession of top-selling album releases in Latin America. Kravitz’s Greatest Hits album, was certified triple platinum in Argentina and was also the country’s #1 selling album of the year in 2001. The album also went platinum in both Brazil and Mexico. In addition, the artist’s previous studio albums Lenny, 5, Mama Said, Circus and Are You Gonna Go My Way, have all either been certified platinum or gold in various countries in both Central and South America, as has his DVD release, Lenny Live, which recently reached gold status.